To view photos from the Kelly Collection, click here. 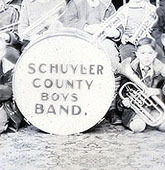 The editor looks back upon his path to Schuyler County, where he has lived for more than 30 years. This account previously appeared on SchuyLines in 2012. SCHUYLER COUNTY, 2014 -- The night John Lennon died, I was working at the Star-Gazette in Elmira as a night copy editor — which means I was on duty when the first bulletin moved across the wires alerting the world to Lennon’s shooting. Back then, on Dec. 8, 1980, such news flashes did not come across the Internet, for it didn’t exist. News of national and international import came to us through a teletype machine, which slowly, line by line on paper, delivered the news as it was disseminated by the Associated Press or United Press International news organizations in New York City. It was also embedded in short order in our computer mainframe, to be called up by the code number affixed to the teletype printout. Yes, we had computers back then. They had started making inroads in the 1970s. We received our local stories by phone modem from our seven bureaus in the region — in Waverly, Towanda, Mansfield, Wellsboro, Corning, Hornell and Watkins Glen — and edited them on our computer screens (assuming they came through the system cleanly instead of garbled, as often happened). The reporters in the room each had a computer, too, for writing stories. What we lacked was the capacity to put all the stories together on one big screen, in final-page form. Such “pagination” units were still a year or two away. We sent our stories, a story at a time, to the composing room, where they came out in finished film form and were affixed — by melted wax, basically — to newspaper page-sized frameworks (which were paper). Once this jigsaw puzzle of stories — plus separate headlines — was completed, the page would go to a large camera to be shot and ultimately turned into a clear film page, a key step on the way to the printing press. We were also shy by several years of the age of digital photography. We had a staff of three photographers who would make the rounds of news and sports events, return to the paper, process the film, make prints, and deliver them to department editors (Sports, Features, City). The editors would measure and mark the size of each photo, work it into a page layout plan (drawn on a sheet of paper) and send the photo and hand-drawn layout to the composing room. This was the age in which the hot-metal construction of pages in the composing room had been supplanted by paper and film images — speeding the process and leading to an attrition in the workforce. But metal or film, full workforce or diminishing, the end result was a trip by the finished page to the press located in the bowels of the building. Workers there would attach to the press the page images; as the 1970s progressed, metal-plated images gave way to flexible film, but the effect was the same. The press would roll, its sound deafening, and the papers would come out of it by the thousands, bound for points North, East, West and South. I used to go down to the press room late at night, after the huge machine started running, and just take in the roar. It was a sensation beyond auditory, for the Star-Gazette press was large, and very heavy, and the concrete-floored room in which it operated vibrated. It was both upsetting and soothing. It always marked a perfect end to a hectic night — a way to lose myself for the moment, to clear my head of words and sentences and headlines and deadlines — and prepare for the drive home to Schuyler County. The subsequent conversation indicated he really wanted to know how the story would be displayed if that death occurred violently. Murphy and I considered the inquiry the result of youthful enthusiasm, and a good dose of imagination. So when the first bulletin came across about the shooting — sometime after 11 p.m. on a teletype machine in a small, adjacent room, sent by the Associated Press office in New York City — Murphy ripped the sheet from the machine and strode back to his desk, looked hard at Scotto (who was editing a local story, oblivious to the news bulletin) and then at me. He shook his head in seeming disbelief and handed me the sheet. John Lennon, it said, had been shot in the back by a crazed fan outside the Dakota Apartment complex where Lennon had been living, and was badly wounded. He was being transported to a hospital. The Star-Gazette had three editions: the South, for the Pennsylvania counties it served; the North, for Steuben and Schuyler Counties; and the City or Metro, for the greater Elmira area, including Horseheads. The Lennon news came across, as I recall, too late for the South edition, but in plenty of time for the second, or North. And Murphy, without coaxing from Scotto, indeed played it big — up top on the front page. Further details were coming in — Lennon had been shot twice in the back by Mark David Chapman, and had been pronounced dead on arrival at the hospital — and so Murphy kept adding text to the story. But what really got his attention was an advisory from the Associated Press saying it would soon have a photo in hand showing Chapman with Lennon earlier in the day, when Lennon signed an album cover for his soon-to-be assassin. The AP was negotiating for the photo. “We’ve gotta have that,” said Murphy. “It’s historic.” There wasn’t much time, though; the final edition deadline was sneaking up on us. And as it neared, we got some bad news: there would be a delay in the photo’s arrival; AP’s negotiations were dragging. I looked at the clock. It was past 1 a.m. Deadline was minutes away — and deadlines were sacrosanct. I once got chewed out for missing one by two minutes. But this was Murphy’s call. “Depends on how much trouble you want,” I said. Murphy got plenty, as it turned out. He waited past deadline five, ten, fifteen, twenty, twenty-five, forty minutes and maybe more; time has dulled the detail, but I remember sweating bullets about it with Murphy as the minutes mounted. At long last, when we were already substantially late — and with delivery drivers starting to complain down in the pickup area outside the building — the photo finally arrived. Murphy grabbed it and carried it to the composing room, where the workers were peering at him with disbelief. Ten to fifteen minutes later, the page with the vaunted photo was being affixed to the press. And sometime after 2 a.m. — far beyond deadline — the final edition started to roll. Murphy did indeed get called in the next day. The daytime bosses were upset enough to phone him in the morning, waking him and, thus, shorting him on sleep. They sharply criticized his decision, telling him that because of his action papers had been delivered late and had cost us some sales. But Murphy kept his composure and took it. He knew he had broken a golden rule; and while as a pure newsman it likely bothered him that he had, another part of him celebrated the moment. He had, in fact, gotten the photo he wanted. And it was historic. I drove five and (later in my eight-year stay) sometimes six days a week from my home in Odessa to the Star-Gazette, and then back again, the return trip coming usually late at night. For I worked mostly on the night shift, which started at 6 p.m. and ran to 2 a.m. On occasion I drew day-shift work, but nights predominated. It was an easy drive in good weather: out of my driveway, turning right onto Main Street in Odessa, right again a block away at Church Street, and then straight ahead until I reached Horseheads. Once through there, I would connect with Route 17 and travel east to the Church Street turnoff in Elmira, and before long I would arrive at the Star-Gazette. The S-G was lively back then, in the daytime full of advertising salespeople, daytime news staff, and business-office workers. While the business offices were generally empty at night, the newsroom was still abuzz, as was the press room and the so-called mail room, where papers coming off the press on conveyor belts were bundled and sorted for delivery across the Twin Tiers. The paper’s circulation topped 40,000 daily, and 50,000 on Sundays. It was a nerve center — one of the most important places in the region. But the work there — at least on the copy desk — was difficult and enervating. By the end of a work week, I was often so tired that my brain felt, quite literally, a bit fuzzy. I strove to rest on my days off, to recharge for what would certainly be a recurrence … more of the same draining workload. My time at home was highly prized, not only because I could share my days with my wife, but also because of the addition of two sons: Jonathan, born on July 5, 1981, and David, born on March 23, 1983. They joined an older half-brother, Bill, who had come to live with us after our move to Odessa, when he was 12. The Haeffner couple were soon a Haeffner quintet, with all of the attendant celebrations that yield memories and photos. Susan was the family photographer. I rarely snapped any, even though I had purchased a good camera and had shot professionally (which is to say as a reporter while working at the Watertown Daily Times in Northern New York in the 1970s). She loved to chronicle all family milestones — from the celebrations to gatherings with her parents and siblings to … well … to the installation of a septic tank in our backyard. I have boxes of photos from the 1980s — when the kids were young, when Susan was young, and when I hadn’t yet ripened enough to let go of my dreams. I once considered it the golden age of the Haeffners, but I tend to perceive things with an equanimity now that sees any period as golden. It just depends on how you look at it. And yes, it affected me at one point. I was in line for a promotion about two years into my stay at the S-G — a post that would allow me back on a daytime schedule. But the assurances I received about that promotion weren’t from the top-of-the-line bosses — who instead moved a woman into the slot from another department. I moaned a lot — I was, it turned out, not only being kept on nights, but being given the toughest desk job there was, trying to corral news from the seven regional bureaus into a cohesive whole against a relentless deadline — but moaning did little good. It was simply the way of the world. A note on the promotion policy involving women: Not all promotions proved successful; but then, the promotion of men didn’t always work, either. But one woman stands out in my mind — a young lady from the Waverly bureau named Diane Bacha. She was an excellent reporter, but seemed destined for toiling in the lower ranks, gathering news on the bureau level. However, someone at the Star-Gazette decided to promote her to the main office, where she worked successfully for a handful of years before moving up the ladder at other Gannett papers and, ultimately, outside of Gannett. She proved herself not only a fine writer and editor, but an outstanding manager — and went on to a fruitful career in the Midwest. I bring all of this up partly to explain my move, ultimately, to the paper’s Sports Department. After I had spent a couple of years in that difficult regional night slot, there was a shift in personnel in the S-G newsroom, with the Regional Editor — the woman who had been given the daytime job I had expected — moving to the post of Managing Editor, and the Managing Editor moving to Sports as its administrator, the Managing Editor/Sports. He was the man who had hired me in the first place: Wayne Boucher. If I were to point to a mentor at that paper, Wayne would be it; he was, at the very least, always supportive. I, meanwhile, was given the title of Regional Editor, but my job did not change. The paper was at that moment jettisoning its traditional afternoon editions. It had for years published both morning and afternoon ones, but now, with the elimination of the one, all editors would be doing night work. There was no more need for them during daylight hours. And so I never got to the daytime job I had sought. Boucher and I, meanwhile, started talking about the possibility of my moving to Sports. There was an opening coming up, and we had always worked well together, so it seemed like a good opportunity. There was some resistance from the news administrators, but Wayne kept lobbying for it, and made it happen. And so I escaped from the grind of the Regional Desk, becoming at first a co-Assistant Sports Editor, and then Sports Editor. And in that capacity I entered the world of column writing. It was a first, tentative step on a path that has led me to compose hundreds of them — some award-winning, and some fairly lame. The reason I started writing them: the paper’s Sports Editor traditionally did so on a weekly basis, with the columns appearing in the high-circulation Sunday editions. My predecessors had included Al Mallette — a longtime Sports Editor perfectly suited to the job before returning to the role of sports reporter shortly after I joined the paper. He was great at writing behind-the-scenes columns, for he knew everybody in the sports world of Elmira. His successor as Sports Editor — a much younger man from Texas named Phil Moldenhauer — wrote quite competently, but lacked the Mallette knowledge, although Al helped him in that area when he could. Moldenhauer stayed three or four years before moving on … and that’s when I slid over to Sports. I did not have the knowledge of a Mallette, and my writing style was, I think, a notch below Moldenhauer’s at the time. But while I found the weekly column deadline a bit daunting, I kept at it, and didn’t embarrass myself too badly. I had grown up in Bloomfield Hills, Michigan, north of Detroit, as an avid reader of the Detroit Free Press and the Detroit News, and as a fan of any professional sports team from that large city. My favorite team was baseball’s Tigers. And my favorite writer — he put in stints at both the Free Press and News, and wrote for the weekly, national Sporting News — was Joe Falls, a man with an easygoing way with words and a great knowledge of Michigan sports and its combatants. I suppose I tried over time to emulate his writing style, although I was also influenced by novelists such as Mark Twain and Kurt Vonnegut Jr. (my two favorite authors) as well as John Fowles (author of The French Lieutenant’s Woman and other complex novels), Margaret Mitchell (Gone With the Wind) and Margaret Craven (I Heard the Owl Call My Name). I actually had occasion to meet two of the gentlemen mentioned in the preceding paragraphs — although “encounter” would be a better word. I encountered Vonnegut when he spoke in the 1990s at Ithaca College. My wife and I enthusiastically attended the event, held in a mid-sized room that was filled to capacity. We got there early, and so had fairly decent seats, perhaps a half-dozen rows deep. While waiting, nature beckoned and I went in search of a rest room. I ventured down one hall, and then turned up another, and saw the rest room ahead, just as its door was opening outward. A tall man with curly, graying hair and a bushy mustache stepped out and, as we passed, he smiled and nodded to me — and I wondered why he seemed so familiar. It was while I was at the urinal that it occurred to me that I had just crossed paths with the great Vonnegut. It’s odd, but his talk does not stand out in my memory, but that moment outside the rest room does. I encountered Joe Falls in quite a different setting: the National Baseball Hall of Fame Museum in Cooperstown. I frequently visited that village and the museum back in the late 1980s and early ’90s — often in conjunction with a business I was running at the time: the purchase and sale of sports memorabilia. There were a number of shows I attended (some as a dealer) in Cooperstown, and sometimes I traveled there in search of memorabilia in its stores. On this occasion I was passing near Cooperstown and decided to visit the museum, and wandered around its various rooms. There is one area on the ground floor, off to the left of the main entrance, that has rotating displays — or did back then. I don’t recall what was being featured on that day, but I found myself and one other man the only people in the room. I passed by him without glancing at him, but as he passed by me a few moments later I looked his way and was stunned to find that I recognized him, and that he was indeed one of my childhood writing heroes — the great Falls. He paused in front of a display and set down a briefcase he was carrying, and I took the opportunity to approach him. I told him, and explained that I had been a huge fan throughout my youthful years, and had myself become a sports editor and columnist — “though not at your level,” I added. “I’m sure you’re being too modest,” he said, although I’m sure he knew better. “Sure,” he said, and he reached down, opened his briefcase, and extracted a fresh, bright-white baseball. He fished a pen out of his shirt pocket, signed the ball and handed it to me. “There you go,” he said. And that was my encounter. It was one of those impactful moments that meant a great deal to me, and even more so when he died a few years later. I have the ball still — sitting on a shelf. I touch it every so often, just for luck, as I pass by it. My career in sports at the Star-Gazette lasted about five years. I loved the Sports Department, except for the ever-present deadlines, to which I never could acclimate. I served as a writer and editor and administrator, carrying out Boucher’s directives. It was a job that was at times dizzying with its amount of detail — covering sports in seven counties was always a challenge — and accordingly there were highlights, lowlights and definite trends. I’m not sure where Dolata came from, but I suspect a larger city. He was a forceful personality hell-bent on getting us to balance our coverage of male and female sports. Part of his motivation was the presence of his daughter on the tennis team of one of the local high schools. I suspect that he was also driven by a sense of fairness, though I didn’t recognize it at the time. And so it was that girls sports made their mark and achieved their place in the mainstream of local sports coverage — now a tradition among regional news organizations. Over the course of about eight years at the Star-Gazette, I logged more than 2,000 round trips from Odessa to Elmira and home again. I wrote scores of columns, edited thousands of stories, wrote thousands of headlines, butted heads with several different bosses, was on the ground floor as computers made significant inroads into the newsroom, and worked with a cast of like-minded people: those who love the written word and the rush that comes with getting that word out to the masses. I spent more time away from Schuyler County than I wanted, but it was always there, every night and every day off, waiting for me, ready to envelop me in its arms and nurse me back to health — to recharge my mental and physical batteries — before sending me out once again to do battle in the workaday world. There was one more development coming that would keep me away from Schuyler for a fairly long period, though: four months during which I was on loan from the Star-Gazette to the then-young USA Today — Gannett’s superb showpiece operation in Washington D.C.
Next: My stint at USA Today, my departure from journalism, and my re-entry into it years later.